Amazing Audio Player is an easy-to-use Windows & Mac app that enables you to create HTML5 audio player for your website. The audio player works on iPhone, iPad, Android, Firefox, Chrome, Safari, Opera, Internet Explorer 11 and Microsoft Edge. 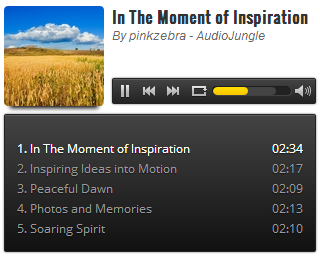 It can also be published as a WordPress Audio Player Plugin, Joomla Audio Player Module or Drupal Audio Player Module. The HTML5 audio player can be easily inserted into HTML editors like Dreamweaver and Frontpage. Or it can be created as a WordPress Audio Player plugin, Joomla Audio Player module or Drupal Audio Player module. You can also insert multiple audio players into one web page. 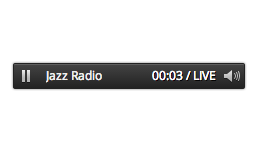 With the pre-made templates, you can create professional bar-style audio player or audio player with playlist. You don't need to convert your mp3 files to any format, the player will play the mp3 files directly. 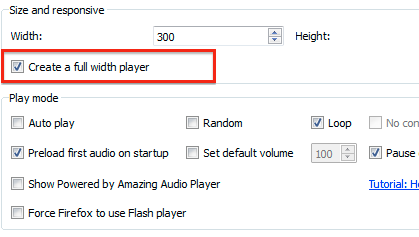 Since Firefox does not support mp3 format in its HTML player, you can also add an optional ogg audio file for it. Amazing Audio Player is a full-functional audio player. Its features also include random playing, auto playing, loop playing, progress bar and volume bar. You can also customise the player with CSS and your own background image. By selecting the option "create a fullwidth audio player", you can easily create a responsive HTML5 audio player for your website. Amazing Audio Player can be used to play an audio live streaming URL or remote mp3 URL.